Use this letter example just after submitting your CV for a job vacancy. It’s not easy to find a job these days so once you found a opportunity you should do everything to improve your job application. Amend this letter as suitable before sending it to the employers. 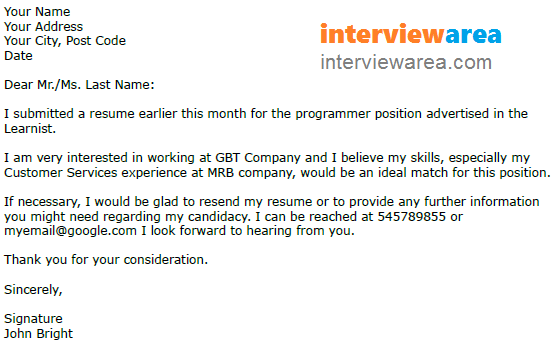 I submitted a resume earlier this month for the programmer position advertised on CV Library. I am very interested in working at GBT Company and I believe my skills, especially my Customer Services experience at MRB company, would be an ideal match for this position. If necessary, I would be glad to resend my resume or to provide any further information you might need regarding my candidacy. I can be reached at 545789855 or email@ domain. com I look forward to hearing from you.